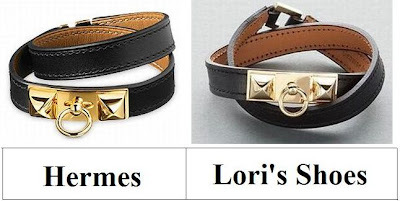 Darlings, in the left corner we have Hermes’ classy Collier de Chien Double Wrap Bracelet; in the right take a gander at the gorgeous Leather Wrap Bracelet with Pyramid Stud and Toggle Detail via Lori’s Shoes. While the Lori’s Shoes Leather Wrap is crafted out of Italian leather, as opposed to the chamonix leather of the Collier de Chien charmer; for a mere $24.00, in comparison to the $520.00 required to snag the Hermes original, it is just as capable of adding a touch of sophistication to one’s accessory drawer – at a price designed with the budget babe in mind! Thanks to Hermes and Lori’s Shoes for the pictures. Don't forget to enter the Three Times Lucky Giveaway for your chance to win three (3) amazing accessories (the Brando Clutch, the Angela Flower Ring in Coral, and the Wood and Pave Ball String Bracelet) from Mimi Boutique. Don't forget to enter the Set Sail in Style Giveaway for your chance to win the Overboard Dress from Shabby Apple. they're almost identical! i'd definitely go for lori's shoes! I'd take the one from Lori's Shoes. This find is so perfect!! I would def go for the bargain option.. you can barely tell the difference!!! I'd definitely go thrifty on this one. I'd so go for the cheaper one. They are identical in so many ways! These are so much alike. I'm going for the bargain, of course. I really like leather bracelets, and have a few cuffs. These are really nice, I'd definitely go with the Lori on this one. Have a nice holiday, Erika! Uh, will forever be obsessed with Lori's Shoes. One of my all time fave places to shop and guest blog at. the Lori's shoes wrap is just as pretty and obviously a lot cheaper so i think i'd go with that one! the price difference is amazing!!! i would go for the cheaper of the 2, and maybe leave with 2 AND some extra cash in my pocket!!! Oh the Lori Shoes one is so close! I think I would have to be thrify on this one! I would die for one Hermes piece! Wow, what a great match! I'd definitely go with Lori's Shoes. I am such a belt whore! Haha, that Lorie's shoes one is perfection! The double wrap bracelet will look so cool on. I love the Hermes one. I love the Hermes bracelet but the other one looks exactly the same. This would be so cute with an all black outfit. I want the Hermes but will probably go with the budget-friendly 'Lori's Shoes' one. Thank you so much for the very sweet birthday wishes love!! It was a magical one indeed - cheers to this new decade! Love them both and the difference in them is minor. My budget would vote for Lori's shoes. Those are both so cute, but I think I'll pass this time on buying either of them. It just seems like I always have too many belts. Like when you're playing Monopoly and you seem to end up with a ridiculous amount of one dollar bills. Too pretty! Such a classy look. This isn't one I'd indulge in--especially not the Hermes one--but I do like the Hermes one a little better cause of the bright gold! Wow, its unbelievable that they are so similar! Good find on your part! So glad there is a cheaper version out there. Thanks! yeesh1 the belts look so familiar! you have me sold at $24!!!! Plus I will be coming to the States for shopping so I cannot wait to pick up a few of the things you've featured. Or styles similar! Totally a dead ringer! I'd go for the less of course! Now this is a perfect comparison & I'd definitely buy the bargain style! If I went for the bargain version on this one, I bet I'd just start fantasizing about the splurge!